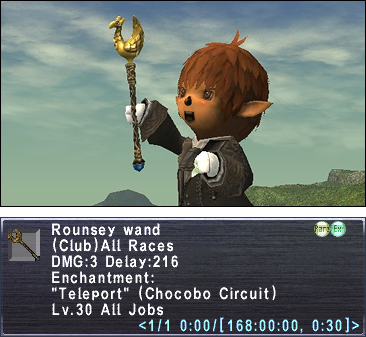 All users who transfer to a Square Enix account within the designated period will receive a special in-game present, the rounsey wand. Read on for a description of its properties and instructions on how to obtain one. * It is not possible to exit to Aht Urhgan Whitegate. * This feature requires players to have the Treasures of Aht Urhgan expansion installed, and to have previously visited the Chocobo Circuit at least once. All players possessing an active PlayOnline/FINAL FANTASY XI service account who transfer to a Square Enix account within the designated period (Wednesday, June 27 to Wednesday, August 31, 2011) will be eligible to receive the item. The bonus item will be distributed in a version update scheduled for September or later. * Further information to be provided as it becomes available. * Schedule and other details subject to change. Items will be distributed within FINAL FANTASY XI via the Mog House Management Union (MHMU)'s delivery service. * All characters existing on the player's account at the time of eligibility determination will be able to obtain the item. * Note that any additional characters created after delivery will not be eligible to receive the item. * Lost or discarded items cannot be replaced, so please be careful. We will not be able to answer questions regarding the timing or status of item distribution to specific accounts.